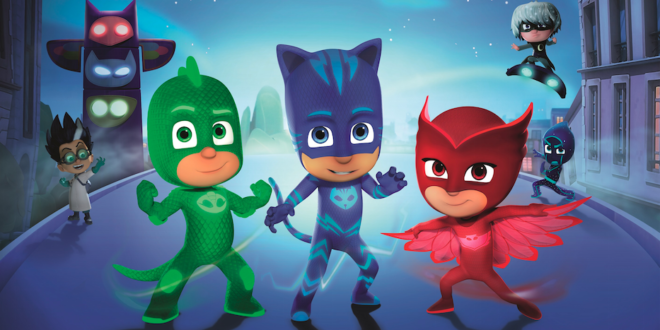 Entertainment One has appointed France TV Distribution to manage the consumer products programme for PJ Masks in the region. eOne and FTD are now collaborating on the merchandise launch for the pre-school property in France, with toys set to launch at mass market and toy specialists from January 2017. Giochi Preziosi is on board to distribute Just Play’s master toy line, which will include action figures, play sets, vehicles, plush, dress-up and role-play, for PJ Masks, which currently airs in France on both the Disney Junior cable network and France 5. The merchandise programme in France will be expanded in autumn/winter 2017. Royer will introduce a line of PJ Masks kids’ footwear while ATM is on board for back-to-school accessories that will launch from 2018.